Our exhibit at the Melbourne Museum starts next Friday, so I've had a really busy week trying to get everything ready. Expect me to talk of nothing else for the next month or so. We have had some fantastic offers of help, although we are still finding staffing the demo games every weekend a bit heavy going. 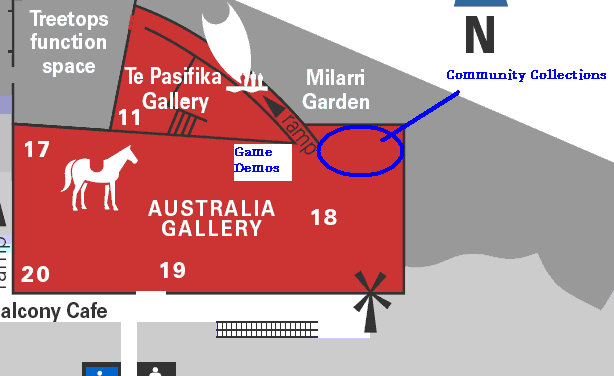 Here's where we'll be - it's a little out of the way, but the demo games really move us into the main part of the gallery. Winner of a special “Fantastic game” prize from the German Spiel des Jahres (Game of the Year) council in 2006, Shadows over Camelot is a co-operative game for up to 7 players. Players take the roles of Knights of the Round Table, working together to stop the siege of Camelot and complete various quests including retrieving Excalibur and the Holy Grail. Each Knight has a different special ability which allows him to change or bend a rule (for example, to draw 3 cards instead of 2). The tension in this game comes from the feeling of impending doom as players struggle to balance all the conflicting threats. If that’s not enough, players can use the optional rules to add a traitor to the mix – one (unknown) Knight who is working against the rest of the group. The very strong and engaging theme of Shadows over Camelot pulls players in to the game, and the high production values and beautiful game boards enhance the gaming experience. This game by an Australian designer is played by 2-4 players, or can be played as a solo puzzle. The theme of the game is the migration of people down the Indonesian archipelago into New Guinea and Australia. In this simple but engaging game, players place jigsaw tiles to build the archipelago of islands, while also claiming land rights over particular ‘nodes’ (points where several tiles meet). All pieces on a completed island score double points, so players have to balance the need to complete islands with the benefits to them if they extend the island (and possibly place more pieces on it). A variety of optional game rules which can be combined in different ways extend the game for experienced players. Don’s second game Freya’s Folly was launched at the international games fair in Essen, Germany, in 2005. (The local distributor has kindly offered us some spare sets of pieces for if when they go missing. Blokus is a very popular “abstract” game – that is, a game that does not have a theme attached to it. Traditional abstract games include Go, Othello, Backgammon and Ludo (and even Chess). The rules are simple – 3 or 4 players take it in turns to place a piece. The only rules are that a piece MUST touch another piece diagonally (it may not touch along any sides). A single player can also play Blokus as a puzzle – see if you can get all the pieces of one colour onto the board at once, following the rule that they cannot touch directly but must be connected on the diagonal. You are welcome to play with this Blokus set, but please make sure that you leave all the pieces beside the board when you’re done. “Travel Blokus” (2005) is a slightly smaller version for 2 players – and “Blokus Trigon” is a new (2006) version where the pieces are made up of connected triangles rather than squares, and are place on a hexagonal board. This unusual dexterity game was nominated for the 2006 German “Kinderspiel des Jahres” (Children’s game of the year) award. Each player takes a piece with a different symbol – crescent moon, lightning, ring or star. Your aim is to be the first player to push a cauldron (red piece) with your symbol into the recessed area in the centre of the game stand. As soon as a piece falls off the game area, a player’s turn ends and the next person can start pushing. The trick? The game is played in pitch dark – fortunately the symbols on the pieces glow in the dark. This is one of the more collectible games in our collection. Released for the Essen games fair in November 2005, the print run of 550 copies was completely sold out before the fair opened. Although originally priced at 25 Euros, there were reports of this game selling for up to 80 Euros during the event. 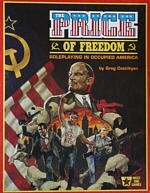 This was a self-published and home-produced game, but it has since been picked up by a major game company and a re-release is imminent. The combination of a rule book full of bad puns, some great little sheep pieces and fiercely competitive game play made this a huge hit. We found a copy of “The most intriguing game ever invented” in a beach house we hired during January 2005. When we finally got around to playing it, we found it to be a great little maths game. The rules are simple – add the number on your card to the number on the card played by the previous player, then move one of your pawns that many spaces forward, or backward if the total is negative. The goal is to get all of your pieces to land exactly on 25 – if you go over 25, you have to go back to the start. “Settlers of Catan” (1995) won the German Spiel des Jahres (Game of the Year) award for that year, and is widely credited as being the game that kick-started the popularity of Eurogames (European-style boardgames). Players earn raw materials and trade them with the other players, then use them to build cities and settlements, expand their armies and build special buildings. 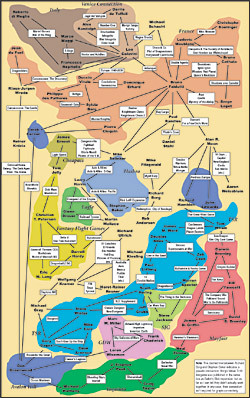 Settlers of Catan was followed by expansions The Seafarers of Catan (1999) and Cities and Knights of Catan (2000), by a cardgame version (1996), by 5-6 player expansion sets for all expansions, by a travel edition and by the Starfarers of Catan (1999). Starship Catan, a card version of Starfarers of Catan, was released in 2001, and The Kids of Catan, a simple building game for young children, in 2003. More recently, Candamir: the first Settlers (2004) and Elasund (2005) have built on the Settlers success story. There has even been a novelisation of the story of Candamir. A Mormon adaptation, The Settlers of Zarahemla, was released in 2003, and die Siedler von Nürnberg (The Settlers of Nuremberg) was released in 1999 to commemorate the 950th anniversary of the city’s charter. There are several special editions of the Settlers games, including the very rare “das Wasser des Lebens” or “Whisky Settlers” (1997), a re-theming of Settlers based on the production of scotch whisky and issued in conjunction with the Glen Grant Distillery company. The most notable, though, is the tenth anniversary 3-D “Treasure Chest” edition (2005) which retailed for nearly $800 Australian. Sadly, and for obvious reasons, this edition is not in our collection. The first Australian Settlers of Catan championships were held in June 2006 at the Australian Games Expo in Albury. The winner, Dennis Bodman, will represent Australia at the world championships in Essen, Germany, in October. In Power Grid, players compete to power cities – by building connections to the cities, buying power plants, and fuelling them with the appropriate raw materials (coal, oil, garbage or plutonium). Power Grid is probably the “heaviest” (most complicated) game that we have on display here, as there are so many different factors for players to balance – can I afford to buy a new power plant? If I buy it, can I afford to power it? Will I be able to connect to a new city? Would it be better to buy a more expensive but environmentally friendlier wind plant? Power Grid is probably Fraser’s favourite game at the moment. 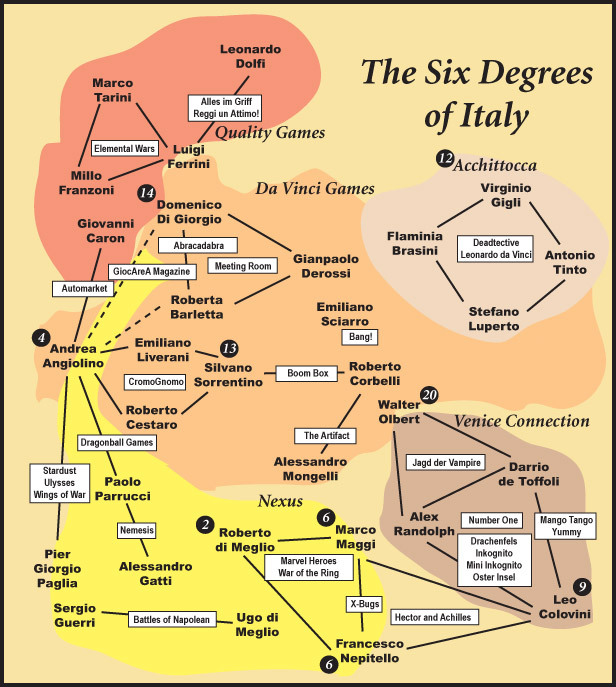 Reiner Knizia is considered one of the world’s great game designers. His prolific output is matched only by his enthusiasm for innovation – one recent game uses a special ink that can hold an electrical charge. The game Ra features an innovative auction mechanic (players bid for tiles, aiming to collect groups of particular tiles in each of the three Epochs of the game). 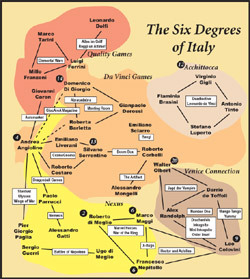 The player must balance the conflicting needs by collecting a variety of different types of tile but at the same time collecting sets of the same tile. This theme of balancing different requirements is often a feature of Knizia’s games. Ra is widely considered one of Knizia’s best games, with the main criticism being that the ancient Egyptian theme is incidental to the game. In Amun-Re, each player takes the role of a pharaoh, aiming to build more pyramids than any other. To accomplish this, players first acquire a province, which they can trade and farm. The profits from trading can buy new provinces and building stones to erect pyramids. Players can use power cards and can offer sacrifice to Amun Re to help them achieve their goals. Tier auf Tier (“Animal upon Animal”) is a delightful and beautifully produced children's dexterity game in which players take turns piling wooden animals on top of one another. Although this is billed as a children's game, we have found that it is enjoyable for adults and children alike. It's also a game where children have some advantage when playing with adults, due to their smaller and sometimes steadier hands. In Big City, players compete to build a city, adding residential and commercial buildings and factories, as well as tram lines, parks, a town hall and a range of special buildings including shopping malls and cinemas. Before they can build, though, each player must acquire the rights to the pieces of land that they need for building. Big City is a light-to-medium-weight game and typically takes around 45 minutes to play, of which the first 5-10 are usually spent oohing and aahing at the pretty plastic pieces. Big City has been out of print for a couple of years now, but copies occasionally appear on eBay and on game trading sites. There are no verifiable rumours of a reprint at this stage. Puerto Rico is generally considered to be one of the three best “Eurogames” ever, and is one of Melissa’s favourites. The 3-5 players are plantation owners in Puerto Rico, growing a variety of crops, which they sell at the trading post or ship back to the old world. Strategically building commercial buildings to gain an advantage, in each round players must choose a role that will give them a slight advantage - but each other player can also take that action. Two different versions of this popular medium-weight historical wargame, which re-enacts the struggle for control of the British Isles from the Roman invasion of 43AD to the Norman conquest in 1066. The new edition from Fantasy Flight games looks much prettier than Melissa’s 20-year-old copy. While the rules have been updated for the new edition, the basic game remains the same – but is now accessible to a new generation of gamers. Many thanks to Scott Nicholson of http://www.boardgameswithscott.com for his permission to show these boardgame reviews. You can see Scott’s reviews at his website, or subscribe to automatically receive new reviews through iTunes. We also have a folder of game reviews, I've spoken to the museum shop and promised the guy there that I'll give him a list of games we're displaying (with distributors ...), I'm not sure what else is left. I have that nagging feeling that I've forgotten something, though. GAME STORE CONFIDENTIAL ~ Screw the mail, where's my Howizter? I'll be making quite a few people cheerful today. That's because this will be a relatively short entry. The last several days were consumed by visiting relatives from California, which included my brother, his daughter and son-in-law, their two kids and my mother. Along with that, my daughter flew in from Chicago, my dad drove out from Boise, my son Wyatt was here and thus commenced three full days of non-gaming activities. Thankfully, all but the oldsters agreed to go to the rodeo with me... so despite not gaming, I at least got to see large animals pound arrogant humans into the dirt. I did want to comment on Thurn and Taxis though. I finally managed to get my copy of this Rio Grande reprint into play a week or so back and it was a unique setting for me. An old buddy of mine and his wife were visiting Idaho and I managed to get Jumbo-Tron to come over and the four of us played this interesting looking Euro. First off... I don't agree that it's "too much like Ticket to Ride". That's an accusation I've seen bandied about frequently. The similarity I think most detractors are talking about is the mechanic of snagging valuable VP's away in a stack of VP's that reduce in value as each one is scored. T2R:Marklin uses this same mechanic and it's a common enough one that singeling it out is pretty petty. I'm not suggesting Thurn and Taxis isn't a decent game, as Euro's go, it is decent. It just doesn't have a hook. You know, it doesn't grab me and give me the desire to play again and again. On top of which, who really gives a crap about cartrights, mail routes and VP's? While I admit the game itself plays well and is smooth, at no point did I feel immersed. For the most part it seemed I was solving a puzzle, allocating my little wooden cities to maximize VP collection and racing to get a Level 7 Mail cart in order to end the game... all while parceling the wooden cities out quick enough so as not to have any left to count against my score. All this makes me wonder why on the detractors of the game on BGG didn't accuse the designers of stealing from Age of Steam as well as Ticket to Ride. After all, the mechanic of getting a higher level Cart is similar to getting a train in Age of Steam that "goes faster". Anyone who has bothered to look at my game ratings on The Geek knows I do like some Euros, so it's not like I'd pick on Thurn and Taxis because it's a Euro. It just isn't an exciting or fetching Euro. Keythedral is a great Euro. T2R as well (and yes, I catagorize the T2R series as Euro's). Age of Steam is a medium heavy Euro that is tough and appealing. RRT is a medium heavy Euro that is Americanized and highly replayable. I even pre-ordered the Roads & Boats reprint from Tom because of all the clamor over what a fantastic game it is.... and for $130+ it had better be a good one. It's my humble opinion that Thurn and Taxis will win the big SDJ award but even that is meaningless to many because Niagra won that already and Niagra is one of the silliest games I've seen produced since I bought my kids a copy of Hungry, Hungry Hippos back in the 80's. All this discussion really does is exhibit how much I enjoy conflict and aggression in my games. I bought Thurn and Taxis, true. But what I really want is Tide of Iron. Or Combat Commander. Or pretty much anything where people can sit down in the evening, crack open a beer or a Gatorade and start blowing the hell out of each other. Or, if weapons aren't involved, screwing each other over in an overt and "in your face" fashion. By the way... if you have parents or grandparents in their 80's, invite them over. Every time I get around my octogenarian parents I come away feeling a little smarter, a little more humble and feeling a little more positive in general. Have a great week and hopefully I'll be back Monday with some new insouciance designed specifically to piss off the largest number of gamers. There has been much discussion about seating position problems in games, usually but not always centred on Puerto Rico. This is usually a static seating problem, for example if you are an average Puerto Rico player, but sitting the left of a village idiot you will be enhanced to the status of Puerto Rico Grand Master, or so some of the discussions seem to imply. Why is it that nobody has talked about the dynamic seating issue in Ra? In Ra you don't have the Village Idiot problem, you have the Junk Bidder problem. The Junk Bidder is the player who has at least two low Sun tiles, usually with values under five. Let us say, hypothetically of course, that you are the player to their left with a God tile and one reasonable Sun tile left. You may, or may not hypothetically speaking, have six different monument tiles and no civilisation tiles. Round after round, one of the two monuments you want, nay need, comes up. Every single time the bag reaches the Junk Bidder they casually dismiss it and call Ra, meaning that yet again you won't be able to use your hypothetical God tile to pick up that seventh monument type. With the God and a bid you thought that you should be able to pick up both a monument and a civilisation tile for an easy ten points before the end of the epoch without any problems. The first time a monument piece that you want is there the Junk Bidder calls Ra, but you need to pass so that you can use your God tile later. Unfortunately there is enough interest in the auction that one of the other players bids and the Junk Bidder is left with all torturous Sun Tiles intact. The third time this happens there is, again hypothetically speaking, one of the monuments you need and a civilisation tile. Of course the Junk Bidder calls Ra, this time you figure you will just take the two points for the God and bid. Of course you are outbid by one of the other players who both seem determined to leave the Junk Bidder empowered to do their worst against you. Three vitally important monuments and a civilisation tile have now gone, you still have your God and Sun tile and the Junk Bidder is still sitting with their three and four Sun Tiles that are turning your life in one of abject misery. An epoch that started so well is heading towards an end with a whimper with you turned into a blubbering incompetent wreck who can't get anything. If this hypothetical game had actually occurred you would have gone from leading in the first epoch with six different monument types to coming dead last at the end of the game. I suppose I should not discuss this with MrSkeletor or he will campaign against "another broken Reiner". Speaking of MrSkeletor I must commend him for raising general table banter and trash talking to a new height this week during a game of Beowulf. Has anyone noticed that a quarter of the board is missing? Or did Doug just get a dud copy? However, I digress. As well as the usual "take the risk, it's only a scratch" and "you don't have three wounds yet" type of comments that seems quite common in our group, MrSkeletor elevated the experience by reading out his interpretations of the thematic descriptions for each encounter along the way. I'm still not entirely sold on the game and the monumental risk taking events that occurred did seem to encourage a little too much "speaking in Danish" from Anna and myself according to Doug, but I would play it again even without MrSkeletor's commentary. I had opened up a new game this morning and when I picked up the counter sheet I noticed that all of the pieces except for one red one had fallen out in transit. Daughter the Younger wandered into the room, looked at what I was doing and said "You need to push the red one out Daddy". Now I must stop writing and play a game with her since she has been asking me so nicely (actually saying "please" without prompting). She is requesting the yellow one with red writing and the grey one.